Jack Nicklaus is considered the greatest golfer of all time. With an unmatched 18 major championships in his career he has really done it all on the golf course. During his lifetime he has created many fantastic memories in golf and here at Killeen castle he has created a world class Jack Nicklaus Signature Design 18 hole Championship golf course. 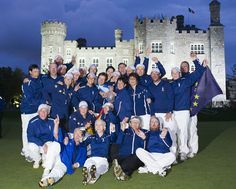 The 2011 Solheim Cup organizing committee were so impressed by the plans of Killeen Castle that they named it as host venue for The 2011 Solheim Cup before construction of the golf course was completed. When construction began Jack was on hand to oversee each stage of development and as a result we are now blessed with a truly majestic golf course. With beautiful views of the Co. Meath countryside throughout our 600 acre estate players will never become bored of the golfing test that is provided. Killeen Castle opened for play in May 2009 and has had the privilege of hosting the Ladies Irish Open from 2010 until 2012. Our highlight to date, was undoubtedly hosting The 2011 Solheim Cup. The tournament set up an enthralling battle between Europe and the USA will be forever remembered as one of the greatest finishes to a golf tournament that has ever been witnessed. Upon completion of the courses construction Jack described Killeen Castle as "truly one of our finest ever creations." We look forward to welcoming you to Killeen Castle to test your golfing skills against "the course that Jack built."